Access physical assessment techniques in a flash—anytime, anywhere! 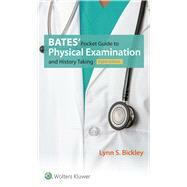 This concise and trusted reference provides authoritative guidance on how to perform the patient interview, physical examination, and other core assessments as well as how to apply clinical reasoning and use shared decision-making in a quick-reference format—all based on a firm understanding of clinical evidence. Bates’ Pocket Guide to Physical Examination and History Taking includes illustrated, step-by-step techniques that outline the correct performance of the physical examination in an easy-to-follow two-column format featuring examination techniques on the left and abnormalities (clearly indicated in red) with differential diagnoses on the right. This highly regarded pocket guide also covers special stages in the life cycle—infancy through adolescence, pregnancy, and aging.